What is Chemical Protective Clothing? People working in the chemicals manufacturing industries and chemicals using industries should be protected from the harmful effect of chemicals. Chemicals may be in liquid form or powder form or gaseous form. So, depending on form of chemical materials, protective clothing is to be made and used. Chemicals protective clothing should be such that the liquid chemicals cannot pass through the clothing and cannot come in contact to skin, gaseous and powder type chemicals cannot enter into the body by respiration. People of the liquid chemicals manufacturing and using industries needs to handle liquid chemicals like acid, liquid dyes, hydrogen per oxide etc. chemicals manually. If these liquid chemicals come in contact to skin then causes damage on the skin and in most cases these liquid chemicals come in contact to skin through the open areas of the clothing. Very compactly woven woolen fabric made clothing can protect the human body from liquid chemicals like hydrochloric acid, nitric acid, sulphuric acid; petroleum etc. Fabric made from wool and polypropylene blended fibers can also protect human body from liquid chemicals. Polyester cotton @67/33 ratio blended fabric finished with 50% organ silicon emulsion, is considered as good acid resistant clothing. Fastness to washing and dry cleaning of this type of clothing is good and also safe for health. Clothing for the workers of the petroleum product manufacturing and petroleum tank cleaners should be petroleum resistant. For this type work, clothing may be made from rubber coated cotton fabric, rubber coated viscose fabric, and polyurethane coated water resistant cotton, polyester and nylon-6 fabric. All the mentioned fabrics are woven and anti static finished. These fabrics works well as petroleum resistant clothing up to 30°C and at more than 30°C it should not be used for more than 30 minutes. In the industries where powder type of drug dust or powder type chemicals are stored or handle or weighted or mixed, physical damage by those powder type chemicals should be considered very carefully. Very fine powder type dust can easily mix with air and can enter inside the body through respiration and contributes to serious health hazards. Under those situations, musk may be used for temporary protection but in cannot be used for longer period. For longer period use, ventilated visor or air stream helmet works well because there is no negative pressure as in the case of musk, and more over clean air flows inside the helmet. Disposable protective clothing can be used for the people of the medicine manufacturing industries, through which harmful cisplatin, etoposide, mitomycin, cyclophosphamide, carmustin, theotepa etc. cannot pass through the clothing into inside the body. Saranex-laminated Tyvek and polyethylene coated Tyvek fabric works very well as protective clothing but air cannot pass easily through this type of clothing. Hence, it is not comfortable for longer period of time. 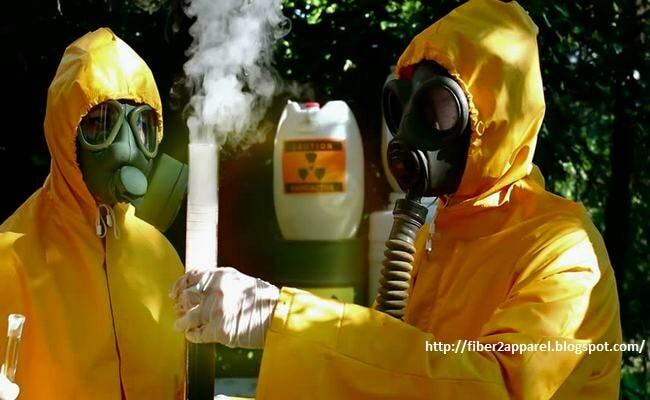 To save human body and life from poisonous gas, fully encapsulated suit can be used. During manufacturing of this type of clothing care should be taken so that gas cannot enter enough through the seam and zipper areas. Encapsulated suit made from saranex-laminated Tyvek fabric in gaseous situation works very well as poisonous gas protective clothing. This type of clothing is very light hence suitable for use but needs to dispose after one time use. One piece butyl-rubber suit is also suitable for this type of use but the clothing is costly. To work inside the fire burned house or car, head hood made from activated charcoal fabric is also suitable for protection against poisonous gas.